It's always the burning question isn't it? Is it worth the spend to upgrade to the latest phone, computer, Thermomix, well, anything? But this new Thermomix has me interested! Apart from the obvious larger screen, (which for the older demographic was a no brainer and had to happen) there are a whole host of features you may be interested in that will maybe get under your skin, and yes, get you reaching for your wallet. If you are after the boring yet essential stuff, scroll to the bottom of the page. I have full specs and list of cooking features there. So to the cooking functions: It still does all the things you know and love. Of course! But and I love this, there are a host of new cooking features that will have you being very clever in the kitchen as long as you have the right recipes. I always bang on about sautéing aromatics at the beginning of a dish for at least 5 minutes and on the highest heat. Problem solved. There is a much higher temperature range going as high as 160°C. WOW, this will shorten sautéing times and is fabulous for so many other foodie things too. Think caramels, honeycomb, other candy work. Sous Vide is an amazing way to cook succulent anything. So I am loving the sound of the sous vide function, even though I currently use the Varoma in a sort of Sous Vide fashion in collaboration with my Stasher Bags which work wonderfully well for marinating and cooking in one easy pouch. But bring it on Vorwerk, I am full of ideas for that function! Aah and yoghurt and kimchi...have so many recipes for these and was forced to use the oven for pot set yoghurt because stirring is the enemy to yoghurt! YAY. Looking forward to the Fermentation function which I assume is a low controlled heat with no stirring...or no stirring by selection. I am also thinking Clotted Cream is now officially possible along with some soft cheeses that also require no stirring....hmmmmn Watch this space kids. Then just casually there was mention of a kettle function. YES PLEASE! I currently have my kettle on the bench, next to the two TM5 and they share power point real estate. I would love to have the kettle banished to the cupboard (still not getting rid of it, but would certainly use it less) and use my trusty Thermo jug as a quick boil kettle when required. There is also talk of a better spatula...more flexible. I'll still be selling and using my amazing spat-ooh-lah-lahs as I think a girl cannot have too many spatulas, but I'm hopeful that the new spatula is going to be good for more than sorbet wrangling. All in all, for not much more price wise, the benefits of upgrading sound fantastic. I think there will definitely be bench space for a TM6 at Team Tenina HQ. How about at yours? Join our mailing list to find out how to win a new TM6 with me. It's as simple as INSIDER club membership. 1GB DDR Ram; endless potential for new features and functions to be added through regular over-the-air software updates. NEW: Heating Precise heating from 100°F up to 320°F in 1-degree steps, with integrated sensors to maintain a constant, precise temperature in the mixing bowl. NEW: Scale Improved weighing during food processing allows an accuracy of 0.1 oz. throughout the whole weighing range, up to 105 ounces per weighing step. Also weighs negative values for extracting a precise amount of ingredients from the bowl. 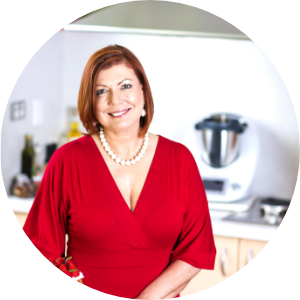 NEW: Fully integrated Cookidoo® access for even more experiences (explore, inspire, search, cook, plan, how-to) directly on the Thermomix® screen; a second device is no longer needed. The world’s biggest cookbook with more than 40,000 delicious recipes from all over the world that work with the unique success guarantee. All available directly on the device via Cookidoo® and via web app, iOS and Android. The Cookidoo® personalizes through tailored recipe recommendations and inspirations. How-tos and tutorials are available for easy or elaborate meals. 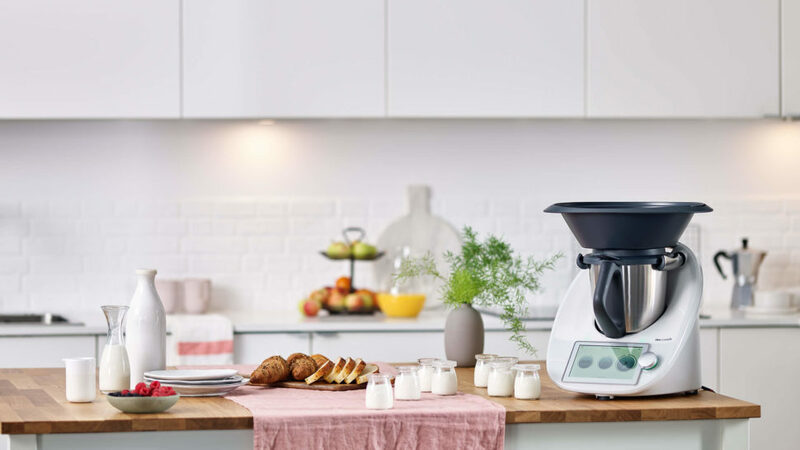 Direct sales: More than 60,000 Thermomix® independent consultants worldwide serve as personal local contacts to ensure high-quality personalized service in more than 40 countries, on all continents.